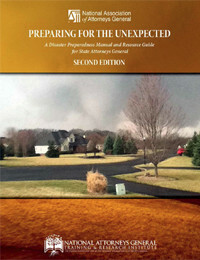 This manual contains case studies and other materials that cover the tools, practices and methods that will assist an attorney general's office in readying for, staying in operation, and dealing with the aftermath of a disaster. This manual contains case studies and other materials that cover the tools, practices and methods that will assist an attorneys general office in readying for, staying in operation, and dealing with the aftermath of a disaster. Includes a categorized checklist, states experience with aspects of disaster preparedness and legal issues arising out of the disaster.